At CBR: Universal Acquires Feature Rights for The Prince and the Dressmaker. At PW: Love and Rockets' Jaime Hernandez Creates Graphic Novel for Kids. 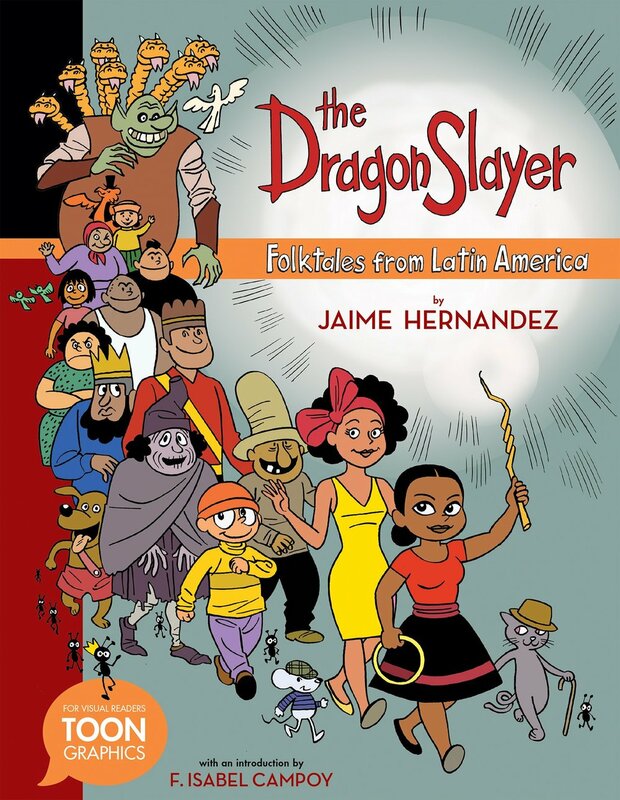 "Children’s publisher Toon Books is marking its 10th anniversary with the release of The Dragon Slayer: Folktales from Latin America, a bilingual graphic novel for young readers by Jaime Hernandez, co-creator of the acclaimed Love and Rockets indie comics series." At PW: Boom! Studios Plans First Original Lumberjanes Graphic Novel. "“First love is a fraught, tender thing, and we loved the idea of focusing on the fears and anxieties the come with starting a relationship in an existing friend group. The rest of it was coming up with the funnest, Lumberjane-iest possible means of expressing that conflict in a big way,” Sturges said." At PW: W.W. Norton Brings on Boughton to Launch Children’s Imprint. At Pajiba: 'Harry Potter' Anti-Abortion Sign Leads To One Hell Of a Tumblr Debate. At Kickstarter: Myst 25th Anniversary Collection. At Two Nerdy History Girls: How Many Handsewn Stitches in an 18thc Man's Shirt? FREE READS: Two outstanding Bloomer books, The Nowhere Girls and Saints & Misfits, are currently available at Riveted Lit. At Medium: Thinking About Jewish Children’s Literature in a Time of Antisemitism. "We are doing a profound disservice to children, both Jewish and not-Jewish, when we produce poorly edited and poorly researched books about real life events. And in the case of the Holocaust, a failure to properly impart the facts or to deliberate re-interpret them, lie, or omit reinforces anti-Semitic structures and worldviews and actively supports anti-semitism." Kindle Deals: Fairy Tales Retold & LADY BLUEBEARD! Shannon Hale on reading and gender.